This 2017 release from Thunderkick is another brilliant online slot game from the studio that awed us with their creativity and uniqueness in games like Bird on a Wire and Well of Wonders. At first site, Barber Shop Uncut slot may look like a pretty normal game, but look closer and you’ll notice this game in affect has 15 Reels and 40 Paylines. Many of the features we’ve come to enjoy in Thunderkick games appear here again – the base game comes with a Re-spins feature guaranteed after every win, and a Free Spins bonus round with multipliers that can deliver up to 30 Free Spins. Plus the Inwinity Spins feature gets another turn here – guaranteeing a win at the end of the bonus round. Barber Shop Uncut RTP (Return to Player) is a very nice 97%, and the volatility is somewhere around low to medium, giving it a good feel – the wins come regular, and if you can crank up the Free Spins with a 3x multiplier, you could be in for quite a windfall. You can play this game on mobile, tablet or desktop right now at one of our favourite slots sites – Betsafe Casino – or read on for our full Barber Shop Uncut Review. The setting for Barber Shop Uncut is a French hair salon – check out the traditional French music that accompanies your spin time. The reels occupy the space where presumably the mirror would be, and to the left and right of the game area are bottles, gels and creams. Just like all Thunderkick games, Barber Shop Uncut features great artwork. The symbols are a mix of smiley characters and hair dressing equipment: combs, shaving equipment, scissors, razors, men with curly moustaches, cravats and bow ties. The most valuable symbol is the guy with the long blonde moustache – 5 of these will hit 15x your stake. Also look out for the Inwinity Spin and Bonus symbols. The standard Thunderkick game interface makes it easy to find your way around this video slot. Just click on the casino chip to choose your stake, which as always will be from 10p to £100 per spin. You can toggle on or off the nice French soundtrack as you prefer. There are 3 key features to look out for in this game. Re-Spins – these come with every win – the winning symbols are fixed whilst the rest of the reels are spun again. This process continues until no more winning lines occur. Free Spins – The Bonus Round of Free Spins is activated when you have collected 5 or more of the Bonus symbols. This is made easier by the fact that any 3 or more will be fixed during the Re-Spins feature. 5 bonus symbols will give you 10 Free Spins, and another 2 are added to the total for every extra bonus symbol you land when you activate the round, up to a maximum of 30 spins. During Free Spins a 3x multiplier is applied to all winnings. Inwinity Spins – This comes at the end of every Free Spins round – as many spins as it takes to create a winning line. Another lovely looking slot from Thunderkick with some really big win potentials if you can get enough Free Spins in the bonus round. The Re-Spins and locked wins feature means you get plenty of action for your money, and the 97% RTP is very pleasing. 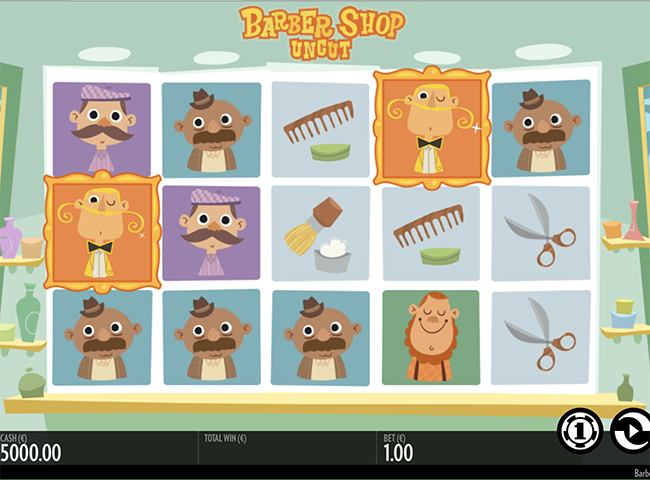 If you’re a fan of other Thundekick games, then we wholeheartedly recommend Barber Shop Uncut Slot.